We received overwhelming interest in CAUCE 2019 and, as of Tuesday, April 9th, are fully sold out. We are in the process of finalizing the delegate list and anticipate there may be a few seats made available. Please contact the CAUCE secretariat at cauce.secretariat@usask.ca if you would like to be put on the waitlist. Fees are subject to change. Please see below for fee descriptions and details. HST will be added to the fees listed. * This rate is for graduate students who are currently registered in a graduate program and not working full-time. Please note that you may register a guest during the conference attendee registration process only. This fee category is not for full conference registration and is for a delegate guest only. Our guest program provides an ideal opportunity for your guest to explore Hamilton and still have the opportunity to attend social functions and our compelling keynote sessions with you. Your guest is invited to attend our Discover Hamilton presentation to learn about all the fun things to do while you are attending the conference. This option is for guests of full-conference registered attendees only. McMaster employees, volunteers, and presenters are not eligible to register under this category. The LIUNA Station Dinner Party is not included in this fee and may be purchased separately. This option is available to the local Hamilton and surrounding community who want to attend the two keynote speaker presentations only. Delegates are invited to stay for the party after dinner. We’re going to have a live tribute band that will play Beatles, Bee Gees, and Abba well into the night. So pack your dancing shoes for a wonderful evening with your CAUCE friends and colleagues. Looking for a great way to kick off CAUCE 2019? Join colleagues from across Canada for a unique networking opportunity! You'll chop, slice, stir, and sip as our chefs take you on a culinary journey influenced by cuisine from across Canada. Begin the experience in founder’s hall, sipping Sparkling Icewine and enjoying cheese and charcuterie as the chefs set the scene for your epicurean adventure. Divide & conquer as each designated team takes on a course (guidance provided, naturally!). Don your chef's hats and aprons, and interact with our chefs as they assist you to create dishes that you'll enjoy family style. 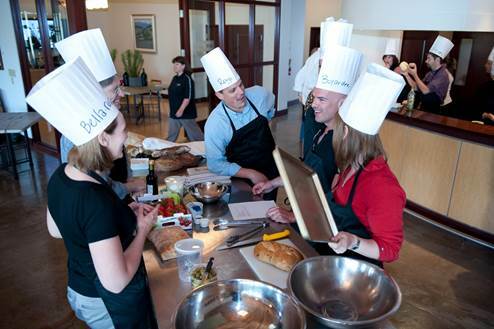 Friendly competition heats up as your team endeavours to prepare the best dish! Don’t be disappointed! Register early, as this event is expected to fill quickly. To see if your institution or organization is a CAUCE member, or to apply, visit the CAUCE website. Every Canadian university or college in good standing with Universities Canada is eligible for Institutional membership. In addition, CAUCE offers Affiliate (Organization, $270) and Professional (Individual, $130) memberships. Confirmation and Cancellation Policy: Registration is not confirmed until payment is received. Payment for registration fees will be accepted through a secure server by credit card only. All credit card transactions will be processed in Canadian dollars and are subject to current exchange rates. You will receive both a receipt and a confirmation by email. If you wish to cancel your registration, a full refund less a $100 administration fee (+ HST) will be issued if you give notice by April 30, 2019, after which refunds will not be issued. The Keynote Speaker only, Delegate Guest and extra LIUNA Station Dinner Party tickets are non-refundable. Half-price discount: We are offering a half-price conference fee for every five (5) conference registrations from the same member institution. If you qualify for a discounted registration, please contact the CAUCE Secretariat. Conference Photo Policy: Registrants of the 2019 CAUCE Annual Conference agree to allow CAUCE and its official photographer to photograph them in the context of the conference. Footage captured by the official photographer may be used in future print and electronic promotional and archival materials. We will use the Guidebook app exclusively for the conference program. Guidebook will give you plenty of ways to organize, plan and enjoy your time. The app will keep you up-to-date on events, speakers, and other key information and you will have all the information you need at your fingertips. You will also receive real-time notifications about any changes to times and locations. To get the most out of CAUCE 2019, download the Guidebook App and don’t forget to check-in! Here is a quick end-user tutorial if you need some help. Please note that we may be required to change, reschedule or cancel any speaker, session or social event with little or no notice.